Our passion is serving fresh, healthy, home-cooked food, providing a hearty welcome and maintaining our reputation for fine fayre and service. We offer an ever-changing Menu, although some primo favourites are a constant such as our Salt and Chilli Squid and the renowned Londesborough Burger . We cater for both Vegan and Vegetarian tastes/lifestyles and will always do our best to provide something for any allergy-driven guests. Nestled in the heart of Stoke Newington, The Londesborough was built in 1864 as a purpose-built Victorian Pub to serve the community. We welcome children and pets with the proviso that dogs must be kept on leads at all times and children are their parents' responsibility. 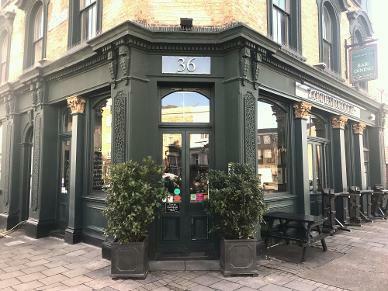 The Londesborough has been family owned and run by brothers Gregory and Patrick Wright since 2008 (who also own the Gastro pub icon, The Peasant in Clerkenwell). "The Londesborough is a really nice neighbourhood local. Friendly staff, welcoming setting, and a lovely back garden on sunny days." "In my opinion this is the best Sunday roast in the area. It's always busy so you'll need to book beforehand on a Sunday. We often pop in during the week for dinner and a drink, the food is always great and the staff are really welcoming and friendly. Good selection of beers and wine, delicious food and an open fire. What more do you need?"